There were dozens of people on foot and on all-terrain vehicles assisting all the motorists they could. The temperatures were now dipping close to single digits, and many individuals were already freezing cold. I saw many volunteers pushing cars and some ATV operators out on this dreary day. These ATV drivers either helped pull small cars out of ditches or piggybacked someone so they could get kids home from school or family members home from work. All the people helping each other were a wonderful sight and fit me like a glove. It seemed like God had given us all a strong love for helping others whenever they needed it. The kindness and caring were amazing. 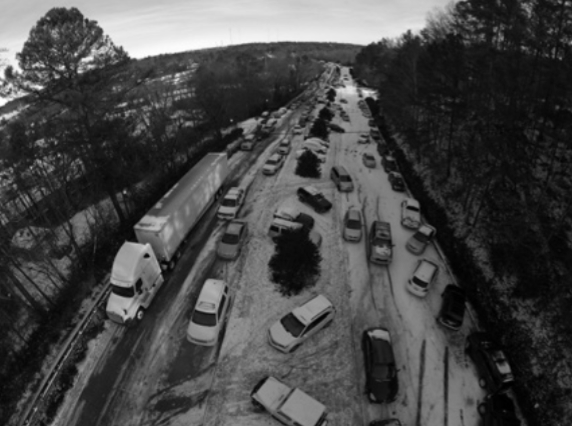 One story broke on the national news about how a neurosurgeon walked more than six miles in these horrible conditions to get to a hospital to operate on a critically injured person with a severe brain trauma. The walk took him more than three hours. This took place not far from the hospital where I would be transported. It was just one example of many absolutely incredible people with their genuine hearts of love who gave in time of need. Many businesses, churches, and schools opened their doors to anyone who needed a place to crash and to be fed. In almost all instances they were fed for free, and one major grocery chain had customers with sleeping bags in the aisles as their “guests” for the night. That is what Birmingham, Alabama, and the state of Alabama are all about. The people of this city have been giving back to one another for many years through multiple tragedies, and this was to be one of those moments. Given Birmingham’s history of generosity and benevolence in crisis, it should not have amazed me to hear that my town once again stepped up as it did.